Multi-drug resistant coagulaso-negative staphylococci (CNS) have become an increasing problem in nosocomial infections connected with the presence of medical devices. The paper aimed to analyze the prevalence of antibiotic resistance in CNS isolated from invasive infection in very low birth weight (VLBW) neonates. Continuous prospective target surveillance of infections was conducted in 2009 at two Polish NICUs that participated in the Polish Neonatology Surveillance Network (PNSN). The study covered 386 neonates with VLBW (≤1500 g), among which 262 cases of invasive infection were detected with predominance of CNS (123; 47%). Altogether, 100 CNS strains were analyzed. The resistance phenotypes were determined according to EUCAST. Resistance genes: mecA, ermA, ermB, ermC, msrA, aac(6')/aph(2''), ant(4')-Ia and aph(3')-IIIa were detected using multiplex PCR. The most common species was S. epidermidis (63%), then S. haemolyticus (28%) and other CNS (9%). Among S. epidermidis, 98% of isolates were resistant to methicillin, 90% to erythromycin, 39% to clindamycin, 95% to gentamicin, 60% to amikacin, 36% to ofloxacin, 2% to tigecycline, 3% to linezolid and 13% to teicoplanin. Among S. haemolyticus isolates, 100% were resistant to methicillin, erythromycin and gentamicin, 18% to clindamycin, 50% to amikacin, 86% to ofloxacin, 14% to tigecycline and 4% to teicoplanin. No resistance to linezolid was detected for S. haemolyticus isolates. Moreover, all isolates of S. epidermidis and S. haemolyticus were susceptible to vancomycin. The mecA gene was detected in 98% of S. epidermidis isolates and all of S. haemolyticus ones. Among macrolide resistance isolates, the ermC was most common in S. epidermidis (60%) while msrA was prevalent in S. haemolyticus (93%). The ermC gene was indicated in all isolates with cMLSB, whereas mrsA was found in isolates with MSB phenotype. Of the aminoglycoside resistance genes, aac(6')/aph(2'') were present alone in 83% of S. epidermidis, whereas aac(6')/aph(2'') with aph(3')-IIIa were predominant in 84% of S. haemolyticus. Knowing the epidemiology and antibiotic resistance of CNS isolated from invasive infection in VLBW neonates is a key step in developing targeted prevention strategies and reducing antibiotic consumption. Coagulase-negative staphylococci (CNS) rank among opportunistic pathogens being a frequent etiologic agent of nosocomial infections connected with the presence of medical devices. The cause for this should be sought in the ability of CNS to create biofilm whereby they pose a particular threat for people with valve prostheses and the ones with implants or catheters . A group which is particularly susceptible to hospital infections are very low birth weight (VLBW) neonates in which CNS are identified as 48 up to 80% of all etiologic agents causing late-onset diseases (LOD). The most frequently isolated species are Staphylococcus epidermidis (58% – 76%) and then Staphylococcus haemolyticus (14% – 32%) [2–4]. Medicating infections in neonates poses a big problem as there is the need to use a therapy quickly. In the event of infections caused by hospital pathogens, the empirical treatment is adjusted based on information on drug-resistance of the bacteria persisting in the ward. A high percentage of S. epidermidis and S. haemolyticus isolates coming from neonates are resistant to many antibiotics: methicillin (86% – 100%), gentamicin (80% – 100%), erythromycin (65% – 100%), oxacillin (92% – 100%), or clindamycin (80% – 100%) [5–7]. The growing importance of coagulase-negative staphylococci, including multidrug-resistant strains, among other etiologic agents of nosocomial infections, forcing researchers to look for the most effective ways to combat these pathogens. Therefore, the aim of the project was to analyze the prevalence of antibiotic resistance in invasive coagulase-negative staphylococci isolates derived from very low birth weight neonates hospitalized in two Polish Neonatal Intensive Care Units (NICUs). Continuous prospective target surveillance of infections was conducted from 1.01.2009 to 31.12.2009 at two Polish NICUs that participated in the Polish Neonatology Surveillance Network (PNSN). The surveillance concerned infants hospitalized at cooperating units whose birth weight was ≤1500 grams (from birth to discharge, or until the weight of 1800 grams or death). All cases of infections were subject to registration, regardless of the time of occurrence of the first symptoms as early-onset infection (EOI) or late-onset infection (LOI). Case patients were defined according to Gastmeier et al. with modifications as neonates with very low birth weight (VLBW) when they had clinical signs of septicemia or of pneumonia, as previously described . The study covered 386 VLBW neonates, among which 262 cases of LOI infection were detected with predominance of CNS (123; 47%) including blood stream infections (54 cases, 43.9%), pneumonia (58 cases, 47.2%) and others. (11 cases, 8.9%). Altogether, one hundred invasive coagulase-negative staphylococci isolates were collected and stored at the temperature of -80°C. Preliminary identification of species was performed using API Staph (bioMerieux) and than multiplex PCR method according to Pereira et al. .
To determine the drug-resistance phenotype, the Kirby-Bauer disk diffusion method was used in which Müller-Hinton 2 LAB-AGAR™ (Biocorp) and antibiotic disks (Oxoid) were utilized: cefoxitin 30 μg, clindamycin 2 μg, erythromycin 15 μg, tigecycline 15 μg, ofloxacin 5 μg, gentamicin 10 μg, amikacin 30 μg, linezolid 10 μg and the E-test method enabling determination of MIC (Minimal Inhibitory Concentration) for teicoplanin and vancomycin (bioMerieux). The results were interpreted according to EUCAST (The European Committee on Antimicrobial Susceptibility Testing) 2012 . To isolate DNA, the Genomic Mini Set (A&A Biotechnology) was used according to the manufacturer’s protocol. The presence of species-specific genes to S. haemolyticus or S. epidermidis and methicillin-resistance mecA gene was confirmed using multiplex PCR amplification according to Pereira et al. with specific primers (Genomed). To detect genes coding the erythromycin-resistance, the multiplex PCR reaction was conducted on ermA, ermC, msrA genes and PCR on the ermB gene, according to the procedure described by Zmantar et al. . The determination of aac(6′)/aph(2″), aph(3′)-IIIa and ant(4′)-Ia genes coding the aminoglycoside-resistance was conducted according to the procedure by Choi et al. . The final pictures from electrophoresis were processed using QuantityOne software, as well as GelDoc2000 device (Bio-Rad, USA). The species identification with the multiplex PCR indicated that 63% of the tested CNS isolates belonged to S. epidermidis species, while 28% to S. haemolyticus (Figure 1). The remaining 9% (n = 9) of isolates belonged to other CNS species, including 4% (n = 4) S. warneri, 2% (n = 2) S. hominis, 2% (n = 2) S. xylosus and 1% (n = 1) S. capitis. An example of the outcome of the multiplex PCR reaction for determining the species of Staphylococcus aureus (108 bp), Staphylococcus epidermidis (124 bp), Staphylococcus haemolyticus (271 bp) and for detecting the presence of mecA gene (154 bp). Legend: Lanes 1 – 10 studied samples; 11 – positive control reference S. aureus ATCC 33592; 2 – positive control reference S. epidermidis ATCC 700296; 13 – positive control reference S. haemolyticus ATCC 29970, 14 – negative control; 15 – marker (Eurx Perfect TM 100 bp DNA Ladder). A detailed analysis of drug resistance with the use of phenotypic and genotypic methods was carried out for isolates of the species S. epidermidis (n = 63) and S. haemolyticus (n = 28). Among the isolates tested, there was a very high percentage of multi-drug resistant strains. Among S. epidermidis, 98% (n = 62) of isolates were resistant to methicillin, 90% (n = 57) to erythromycin, 39% (n = 25) to clindamycin, 95% (n = 60) to gentamicin, 60% (n = 38) to amikacin, 36% (n = 23) to ofloxacin, 2% (n = 1) to tigecycline, 3% (n = 2) to linezolid and 13% (n = 8) to teicoplanin. Among S. haemolyticus isolates, 100% (n = 28) were resistant to methicillin, erythromycin and gentamicin, 18% (n = 5) to clindamycin, 50% (n = 14) to amikacin, 86% (n = 24) to ofloxacin, 14% (n = 4) to tigecycline and 4% (n = 1) to teicoplanin. No resistance to linezolid was detected for S. haemolyticus isolates. Moreover, all isolates of S. epidermidis and S. haemolyticus were susceptible to vancomycin (Figure 2). 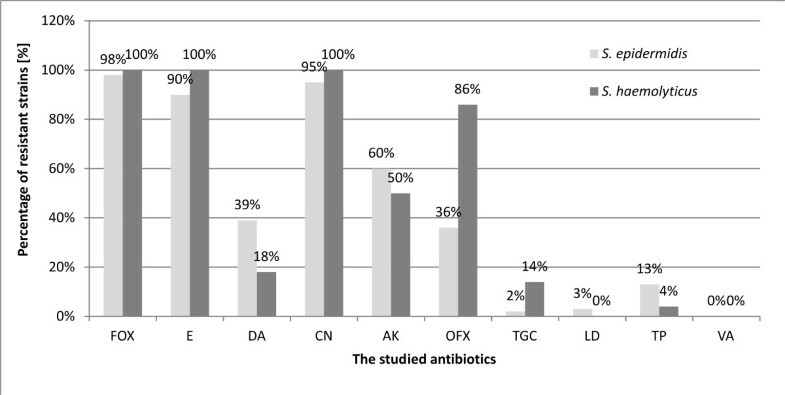 The percentage of isolates of the species S. epidermidis and S . haemolyticus , resistant to the studied antibiotics. Using E-test, the values for MIC50 and MIC90 were determined for teicoplanin and vancomycin. For S. epidermidis, MIC50 and MIC90 for teicoplanin was equal to 2 and 6, respectively, while for vancomycin, it was 2 and 3. For S. haemolyticus, MIC50 and MIC90 for teicoplanin was equal to 2 and 3, respectively, and for vancomycin, it was 2 and 3. Among S. epidermidis isolates resistant to macrolides (n = 57), the cMLSB and MSB phenotypes were most common, and performed in 43% (n = 25) and 40% (n = 23) of isolates, respectively. While the iMLSB phenotype was present in 16% (n = 9) of S. epidermidis. The MSB phenotype was predominant among S. haemolyticus `isolates (n = 28), and appeared in 82% of isolates (n = 23), whereas cMLSB phenotype was detected in 18% of the isolates (n = 5). In the case of S. heamolyticus, the MSB phenotype was not detected (Figure 3). 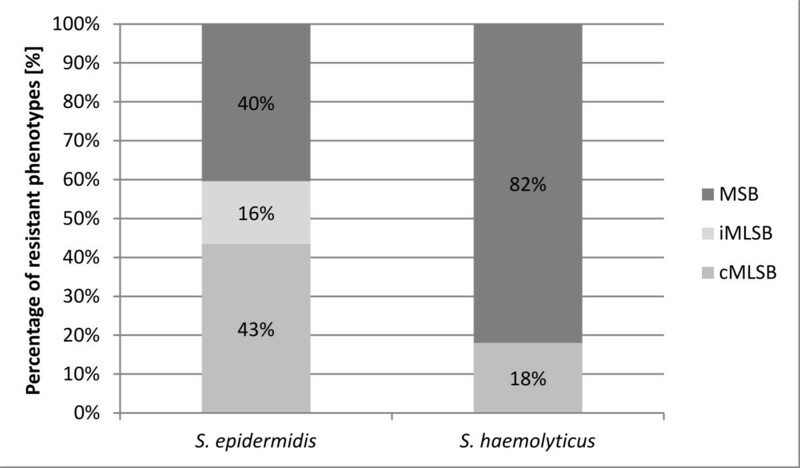 The percentage of isolates of the species S. epidermidis and S . haemolyticus with macrolide resistance phenotype cMLS B , iMLS B and MS B . The presence of mecA gene was confirmed with the multiplex PCR method in 62 S. epidermidis (98%) isolates and in 28 isolates of the species S. haemolyticus (100%) (Figure 1). The ermC gene was predominant in S. epidermidis isolates (n = 34; 60%), while in S. haemolyticus was present only in 2 isolates (7%). On the other hand, msrA gene was prevalent in S. haemolyticus isolates (n = 26; 93%), while in S. epidermidis it was much less frequent (n = 23; 40%). It is noteworthy to remark that one of the S. haemolyticus isolates possessed both msrA and ermC genes simultaneously. The presence of ermA oraz ermB genes was not demonstrated in the studied isolate pool (Figure 4). An example of the outcome of the multiplex PCR reaction for determining the genes coding macrolide resistance ermA (139 bp), ermC (190 bp) and msrA (163 bp). Legend: Lane 1 –marker (Eurx Perfect TM 100 bp DNA Ladder ); 2 – 17 studied samples; 18 – positive control reference msrA W2/28; 19 – positive control reference ermC W2/55; 20 – negative control. S. epidermidis isolates resistant to macrolides, of cMLSB and iMLSB resistance phenotype, possessed ermC gene (n = 34; 60%). While five S. haemolyticus isolates of cMLSB resistance phenotype demonstarted the presence of various genes, including three with msrA gene, in the second one ermC and in the remaining one of ermC and msrA genes at the same time. In all S. epidermidis isolates (n = 23; 100%) and S. haemoltyticus (n = 23; 100%) of MSB phenotype, gene msrA was present. Among the genes coding aminoglycoside resistance, aac(6′)/aph(2″) gene was the most frequent, and the genes more rare were aph(3′)-Ia and aph(3′)-IIIa. In S. epidermidis, isolates with the aac(6′)/aph(2″) gene were prevalent (n = 49; 83%), while in S. haemolyticus, the aac(6′)/aph(2″) was the most frequent together with aph(3′)-IIIa (n = 22; 84%) (Figures 5 and 6). An example of the outcome of the multiplex PCR reaction for determining the genes coding aminoglycoside resistance aac(6′)/aph(2″) (491 bp), aph(3′)-IIIa (292 bp), ant(4′)-Ia (135 bp). Legend: lanes 1 – 16 studied samples; 17 – positive control reference aac(6')/aph(2") and aph(3')-IIIa W2/60; 18 – positive control reference aac(6')/aph(2") and ant(4')-Ia W2/9, 19 – negative control, 20 – marker (Eurx Perfect TM 100 bp DNA Ladder). Percentage of aminoglycoside resistance genes: aac(6′)/aph(2″), aph(3′)-IIIa, ant(4′)-Ia in isolates of the species S. epidermidis and S. haemolyticus. Infections caused by coagulase-negative staphylococci are among the most common causes of death among infants with very low birth weight . This is due to the fact that staphylococcal biofilm can be formed on biomaterials, from which are made various types of devices used in patients chronically hospitalized. Bacteria growing in biofilm are characterized by an increased resistance to the host immune system and antibiotic use, making it more difficult and significantly extending the patient’s hospitalization [1, 15]. The researched CNS isolates demonstrated multi-drug resistance. 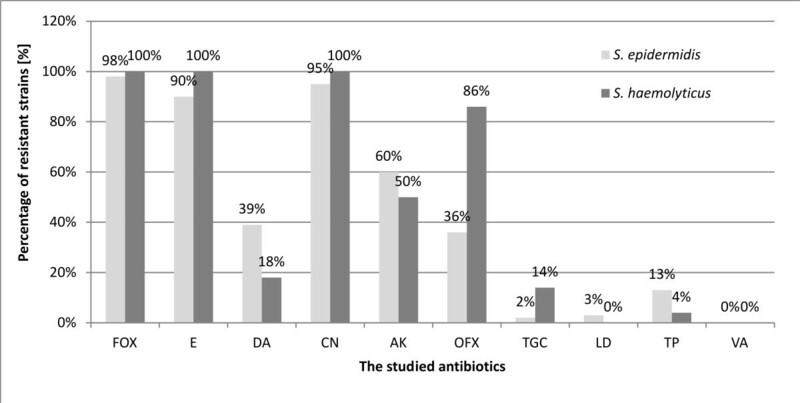 The studied S. epidermidis isolates and S. haemolyticus were resistant to methicillin, in 98% and 100%, respectively, as well as to the majority of the remaining antibiotics that were studied. These results are concurrent with the literature data where for CNS isolated from neonatal infections the percentage of methicillin-resistant strains (methicillin-resistant coagulase-negative staphylococci, MRCNS) was in the range of 86-100%, and, moreover, these bacteria was connected with multiple resistance to other antibiotics [6, 7]. Investigation of the mecA gene in CNS using the PCR technique is nowadays regarded as the gold standard with a view to determining methicillin resistance . In our study, meticillin-resistance phenotype for all the researched strains was confirmed by the detection of the mecA gene. Similar results were described by other authors . The group of isolates was characterized by high erythromycin resistance which was 84% for isolates of S. epidermidis and 100% for S. haemolyticus. The results obtained are similar to those of Bialkowska-Hobrzanska et al. where 100% of isolates S. epidermidis and 92% of S. haemolyticus isolated from neonates were erythromycin-resistant , as well as similar to the data obtained by Abd El Hafez et al. where the erythromycin resistance for isolates of S. epidermidis coming from neonates was 86% . Clindamycin resistance was demonstrated in 26% of isolates of S. epidermidis and 28% of isolates of S. haemolyticus. The determined percentage of clindamycin resistance was significantly lower than that described by Bialkowska-Hobrzanska et al. where for S. epidermidis it was equal to 92%, and for S. haemolyticus 85% ; similarly, Abd El Hafez et al. demonstated 75.9% of isolates of S. epidermidis as resistant , and higher than that proven by van den Hoogen et al. equal to 15% for CNS altogether . Among the S. epidermidis strains that were macrolide-resistant, the cMLSB phenotype constituted 43% and MSB 40% whereas in S. haemolyticus the most frequently detected MSB phenotype occurred in 82% of isolates. Similar results were described by Gheradi et al. who researched CNS coming from hospital infections where 38% of isolates of S. epidermidis and 80% of isolates of S. haemolyticus had the MSB phenotype and 28.5% of isolates of S. epidermidis had the cMLSB phenotype . However, Gatermann et al. clearly described a lower percentage of isolates of S. haemolyticus with the phenotype MSB equal to 30.2% . For the isolates of S. epidermidis researched on with the cMLSB and iMLSB phenotypes, the occurrence of the ermC gene was demonstrated and with the MSB phenotype, the msrA gene. However, 3 out of 5 S. haemolyticus isolates with the cMLSB phenotype had the msrA gene, but did not have the emrC gene. Moreover, in the group of isolates of S. haemolyticus with the MSB resistance phenotype, it was demonstrated that one isolate had no msrA gene. Probably, those isolates had other genes coding the erythromycin resistance. The recorded lack of ermA and ermB genes among the isolates researched on is in conformity with the results of other scientists researching CNS who indicated the presence of these genes only as high as 1.8% – 7.2% for ermA and below 1% for ermB. The gentamicin resistance was 93% for S. epidermidis, 100% for S. haemolyticus and it was higher than quoted in the literature for S. epidermidis 69.2 – 89.5% [17, 21] and for CNS altogether 85% except the results obtained by Bialkowska-Hobrzanska et al. where for both S. epidermidis and S. haemolyticus the resistance equaled 100% . In the case of amikacin, the resistant strains of S. epidermidis constituted 51% of those studied, whereas 31% of S. haemolyticus isolates were amikacin-resistant. From among the genes coding aminoglycoside resistance, the most frequently identified gene was aac(6′)/aph(2″) which both in S. epidermidis and S. haemolyticus occurred in 90% of cases. In the case of CNS isolates isolated from neonates researched by Klingenberg et al. 69.4% of subjects had the aac(6′)/aph(2″) gene . Also, among isolates coming from various groups of patients with hospital infections, the main role in coding aminoglycoside resistance had the aac(6′)/aph(2″) gene occurring in 70 – 90% of CNS isolates . Characteristic of S. haemolyticus was the presence, along with the aac(6′)/aph(2″) gene, of another gene coding aminoglycoside resistance, meaning aph(3′)-IIIa (78%). The comparison of resistance obtained by means of phenotypic methods and genotypic methods enabled observing certain discrepancies. Similarly, Choi et al. observed that only in ca. 50% of CNS isolates there existed a correlation between the phenotype of amikacin resistance and the genotype . According to recommendations of EUCAST (2012) , the isolates demonstrating gentamicin resistance are to be treated as having a general aminoglycoside resistance with the exception of streptomycin, as this one is most probably coded by the aac(6′)/aph(2″) gene the product of which modifies antibiotics such as gentamicin, kanamycin, tobramycin and amikacin . The phenotype of gentamicin resistance, despite the missing aac(6′)/aph(2″) gene, may be caused by the presence of other genes coding aminoglycoside resistance which were not determined in the method used. The observed lack of aminoglycoside resistance phenotype in 3 isolates of S. epidermidis having the aac(6′)/aph(2″) gene probably signifies the loss of functionality of that gene. The determination of glycopeptide resistance constitutes a significant part of the characteristics of the CNS isolates as these antibiotics are most frequently administered in the empirical treatment of MRCNS infections in VLBW neonates. In the pool of the studied CNS isolates, all of them were susceptible to vancomycin, which is concurrent with observations made by other researchers dealing with CNS isolated from neonatal infections [5, 6, 17]. Nevertheless, the MIC value for individual isolates achieved the point of 4 mg/L which is the cut-off point for resistant isolates . The fact of obtaining vancomycin resistance by coagulase-negative staphylococci is confirmed by cases of vancomycin resistance among CNS isolates isolated from infections in various groups of patients, which were recorded by several different research groups . In the case of teicoplanin in the pool of isolates researched, resistance was proven for 13% of S. epidermidis and 3% of S. haemolyticus, which constitutes a conformation of increasing glycopeptide antibiotic resistance. Similar results were obtained by Trueba et al. where 30.4% of isolates of S. epidermidis and 35.7% of S. haemolyticus turned out to be teicoplanin-resistant  and Kristyof et al. where 32% of S. haemolyticus demonstrated resistance . The multi-drug resistance profiles obtained for isolates of coagulase-negative staphylococci isolated from infections of VLBW neonates hospitalized in NICUs indicate that there is a need to constantly monitor the resistance of these strains. At present, the drugs of choice are vancomycin and teicoplanin with the reservation that a quick selection of teicoplanin-resistant isolates of CNS is possible. The study was approved by Jagiellonian University Bioethical Committee decision no. KBET/94/B/2009. This study was supported by a grant from the National Science Centre no. N N401 615 340. MBW designed the study, analyzed and interpreted the data, financially supported the study and wrote the manuscript; MBK and EG collected the data about VLBW neonates; MS collected the CNS isolates; MG and ML performed the molecular studies; JWM and PBH designed the Polish Neonatology Surveillance Network (PNSN); MB prepared the literature. All authors read and approved the final manuscript.